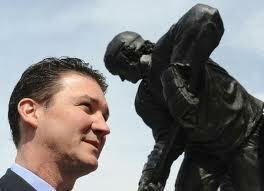 Mario Lemieux - Pittsburghs Beautiful People! Hailing from Montreal, Quebec, this former hockey legend came to Pittsburgh at 18 to play for the Penguins and is now part of the landscape! This now Co-owner of the Pittsburgh Penguins played a crucial role in ensuring the city’s team remained put in Pittsburgh, and his passion has helped make the team one of the most successful ever in the National Hockey League. He is the only person to win the Stanley Cup both as a player and as an owner. This adopted Pittsburgher is regarded as one of the best hockey players of all time, this former player and now owner even has a statue erected in his honor outside of the Consol Energy Center! Retiring twice during his career due to severe health problems, and only able to playing 915 out of a potential 1428 regular season NHL games, Lemieux’s career was plagued by health problems, including Hodgkin’s lymphoma (a form of cancer), which forced him to retire at the height of his career, and back pain said to be so bad other people tied his skates. Despite his illness and severe injuries, has a stellar seventeen-year career record as a player, leading Pittsburgh to two Stanley Cups in 1991 and 1992, plus helping Canada achieve gold at the 2002 Olympic Games and 2004 Hockey World Cup. He may also just be the most decorated player in NHL history, starting his career as Rookie of the year (Calder Memorial Trophy), and going on to win three Hart Awards as the league’s Most Valuable Player to his team, six Art Ross Trophies for being the league’s leading scorer, two Conn Smythe trophies as playoff Most Valuable Player, plus the All-Star Game MVP award. Lemieux was the first rookie in NHL history to be named the All-Star Game’s Most Valuable Player. Lemieux was immediately inducted into the Hockey Hall of Fame upon his 1997 retirement, with the usual three year waiting period being waived. Often called the savior of the Penguins, it is clear to see why. Now Co-Owner and Chairman is credited with bringing the team back from the brink of disaster, taking the unusual step of buying his team and assumed the positions of chairman of the board, president, and chief executive officer in 1999. Lemieux used his debt from of deferred salary, which added up to $30 million, and made him the Penguins’ largest creditor, as credit for the purchase. Under Lemieux’s business leadership the Penguins were able to repay all creditors, both secured and unsecured. In 2006 he also personally negotiated a new arena, and safeguarded the Penguins home in Pittsburgh for another 30 years. Off the ice, Lemieux dedicates a great deal of time and money to the Pittsburgh community. In 1993, the same year he was diagnosed with Hodgkin’s disease, Lemieux created The Mario Lemieux Foundation, to fund medical research projects. Lemieux and his wife devote much time to fundraising for this cause, including annual luncheon and golf events. Over the years funds raised have been used to maintain current facilities, provide funds for cancer research, plus establish and expand to include new charitable projects. For example, Austin’s Playrooms Project was established in 2000 following the couple’s experience while caring for their profoundly premature infant son. Lemieux’s foundation now has over 25 playrooms, including one of a Military base. In 2005, the Lemiuex Family Centre was established to assist families transiting from hospital care back to home life. He also founded the organization Athletes for Hope with other professional athletes, including Muhammad Ali, Lance Armstrong, Andre Agassi and Tony Hawk in 2007. This charitable organization works to inspire other professional athletes to get involved in community work. This honorary Pittsburg man truly contributes to the community – not just with his crucial role in Pittsburgh hockey, by also with Lemieux’s tireless philanthropy.